alaTest has collected and analyzed 1015 reviews of LG 55EG9 Series. The average rating for this product is 4.6/5, compared to an average rating of 4.6/5 for other products in the same category for all reviews. Opinions about the design and size are generally positive. The price and usability are also appreciated. OLED picture quality is the best you can get, and LG's EG9600 is the finest one we've seen so far. The cheapest OLED TV is no bargain, but at less than $2,000 it's actually affordable for a lot of people. If you want the joy of OLED without taking out another mortgage, this is your only option. 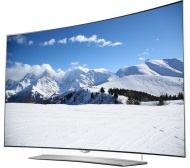 No TV delivers the same level of picture quality for the price of the LG 55EG9100. OLED technology once again produces the best picture possible, though at a very high price, in LG's gorgeous curved 4K EG9600 HDTV series. If you want the latest tech, and money is no object, this television should be at the top of your list. Top-notch picture quality with perfect blacks and "infinite" contrast. Accurate colors. Loads of connected features. Attractive design. Very expensive. Only three HDMI ports. The incredibly expensive OLED-powered LG EG9600 series delivers the best picture quality we've ever tested. If you have the money to spend freely on this TV’s price tag, then the LG EG9600 will give you display quality better than anything anyone else you know has, unless they own the same TV. The LG 55EG9100 provides a best-in-class OLED picture with jaw-dropping viewing angles, but for the price we'd like 4K resolution. The most affordable OLED on the market still delivers jaw-dropping quality.